Snapshot measuring 4.5 x 2.75 inches. I have a bunch of snapshots of this guy, in different outfits and different locations, one or two with a lady companion, most outdoors. This is probably my favorite. It’s a nice, clear shot, and he looks great, like an ad for some rugged cologne. That coat! Those boots! He’s laboring in the great outdoors, and yet he’s wearing a tie! My first thought was that it was a picture of him camping, but the Boy Scout in me realized that it was pretty sloppily assembled for a campfire, not to mention the lack of any other evidence of a campsite like a tent or cookware, so my guess is that he’s engaged in the chore of burning some recently cleared deadwood. 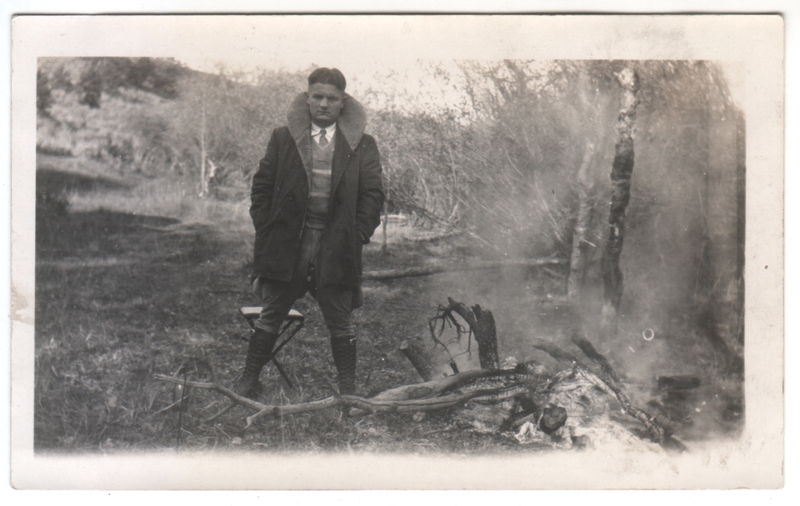 In any case, he brought along a handy folding stool so that he could enjoy the blaze in relaxed comfort (when he wasn’t standing to pose for the camera, of course). Love his wide stance, hands in his pockets, collar up, bursting with macho pride! Not so sure it’s a good idea to start a fire so near to the trees, though. Agreed! He’ll be burning more than just the deadwood at that rate. Good call! He does have a Jack London quality.